North Africa’s Next War - The Maghreb Times ! If the United Nations doesn’t step up, the long-simmering conflict in Western Sahara could soon boil over. Getting from the Polisario Front’s political headquarters, in refugee camps in southern Algeria, to one of its military bases, in Tifariti, took a spine-shattering 12-hour ride in a caravan of four-by-fours over rocky terrain. Guerguerat is another two days’ drive southwest toward the Atlantic. Both sides have generally respected the informal border, marked by a 1,600-mile-long Moroccan-built sand berm, since 1991 — until last August, when Morocco sent security forces to the other side of the berm and into Guerguerat, its greatest violation of the cease-fire in more than 25 years. The Moroccan forces came to accompany a construction team that is building a road. The road would expand Moroccan control over trade in the disputed territory, easing the trip for the hundreds of trucks it sends south daily loaded with produce and goods and giving Morocco oversight in a notorious trafficking hub. The fragile architecture of peace in the Western Sahara is now on the brink of collapse. 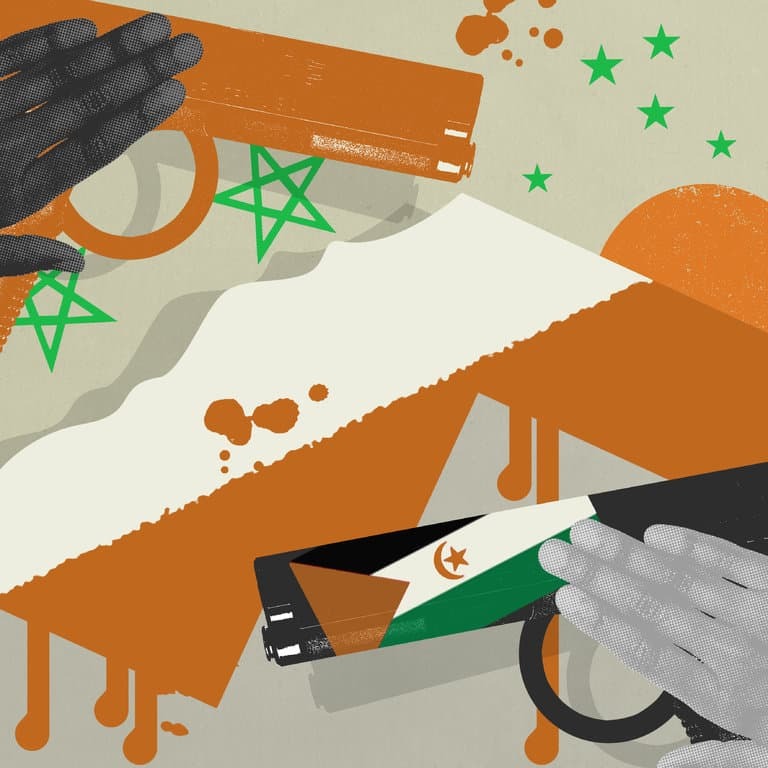 The 1991 cease-fire promised the people of Western Sahara a referendum on self-determination. More than 25 years later, it has not taken place. Refugees born and raised in exile are beating the drums for war. In Tifariti, a few bombed-out buildings have served as canvases for artists and activists. On one, an Algerian artist painted “The End” in six-foot-high white block letters against a black background, and set up rows of chairs opposite it for a viewing. It portrayed the passive spectatorship of the international community in the face of a conflict often framed as irresolvable. A few hundred feet away, a Spanish-funded housing project lies unfinished and abandoned. It was started just after the cease-fire, when hopes were high that the conflict’s tens of thousands of refugees would return. The situation has long seemed frozen. Morocco has for more than two decades stonewalled the referendum that is the primary mandate of the United Nations peacekeeping mission here, known by its acronym, Minurso. In 2007, Morocco offered an alternative: declaring Western Sahara an autonomous part of Morocco, closing once and for all the issue of self-determination. In July, after the Polisario Front’s secretary general of 40 years died, the group elected a new leader, Brahim Ghali. Mr. Ghali is a former military commander who led operations against first the Spanish and then the Moroccans. The following month, Morocco violated the cease-fire and sent forces to accompany the building of the road through Guerguerat. Mr. Ghali sounded troubled when I spoke with him in the camps on the Algerian side of the border. As we sipped sweet tea, I told him things had changed since my last visit two years earlier. Back then refugees told me patience was their weapon. Now they were telling me their patience had run out. On Aug. 15, Mr. Ghali sent a letter to Mr. Ban warning him of the danger represented by the Moroccan cease-fire violation. The Polisario Front requested that the United Nations intervene immediately to uphold the military agreement of the cease-fire, which stipulates that neither side may venture outside agreed-upon borders. No response came for 13 days, Mr. Ghali told me. In the meantime, the Polisario Front sent its own fighters to Guerguerat to stop the road building. They remain there today, locked in a standoff with the Moroccans, with Minurso vehicles watching over the standoff. Sahrawis, as the people of Western Sahara are known, say Minurso must either carry out the referendum or withdraw and make way for war. West of Tifariti, about 50 miles south of the wall, a unit of aging yet fine-tuned Russian troop carriers maneuvers and anticipates battle. Their commander is Abdelhay Moy, a 70-year-old who joined the Polisario Front’s guerrilla war against Spain when he was 19. Back in the refugee camps in Algeria, I wondered how rapid advances in technology would affect the Sahrawi youth. Two years ago, painfully sluggish internet was spottily available at a couple of cybercafes here and there. Now the young people swap WhatsApp messages and upload videos on cheap Chinese smartphones. The increasing prominence of social media and the internet is giving young people inspiration and a louder voice in their communities. With North Africa still stunned by the destabilizations of the Arab Spring, and conflicts in Mali and Libya continuing, there is no appetite in neighboring countries for a new outbreak of war over Western Sahara. Nevertheless, over the past year I have heard Algerian officials and both Western and African diplomatic advisers to the Polisario Front privately acknowledge that after a quarter century of Moroccan obstructions and United Nations complacency, the only option left for Sahrawis is to pick up arms and fight for the territory. Algeria in Photos | Best Countries.